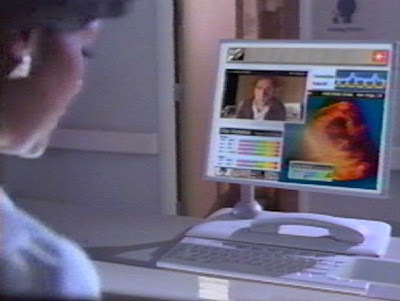 The 1991 Pacific Bell concept video that we looked at in pieces a couple weeks back imagines a world of communication much like that of Connections from AT&T. Parts one through three of this unnamed Pacific Bell video appear below. It's interesting that Pacific Bell didn't even make it to 2003 under that name. The video isn't too bad - though it turned out technology didn't advance quite that rapidly - the wide and flat screens shown are only just now becoming widespread and only quite wealthy people would have a wallscreen that big unless it were projected. So yes, we can do most of what was in the video even if a few years late...the trouble is that it turned out people don't want to. The doctor in his robe shows the problem with video calls. Who really wants to talk to and be seen by a co-worker half-awake? Who wants to have to have perfectly clean rooms all the time in case they'll be in the background of your video calls? As it turns out, people don't want to control their computers by voice - point-and-click is more efficient. Nobody wants to handwrite rather than type where there's an option. There has been no popular merger of voice mail and e-mail. The big thing they missed was the availability and power of portable devices, though this might be due to the business at the time, with cell phones being a rather smaller part of it than they are now.